Annie’s Alteration is your quality alterations Knoxville specialist. We are the place that other Knoxville alterations shops send their difficult & complex jobs to! Our experts are the best at making your clothing aid you in putting your best foot forward. In today’s hyper-competitive job market and workplace environment, Annie’s Alteration Knoxville will give you the advantage over your competition in making the best presentation of yourself to the world! Your social life is important as well, so why not let Annie’s make over your entire wardrobe? Your confidence will soar as you realize that you are presenting the best possible image in all of your activities. At Annie’s Alteration, we are experts at taking measurements and precisely fitting your garment to you. Clothing that is purchased “off the rack” is made to fit the majority of the population, but not fit the majority well. Each person’s body has differences that can make standard clothing tend to fit poorly. We will both take measurements and custom fit your article of clothing to you, so that we can alter your garment to fit the only person that it really needs to fit – you! NOTE: We do not custom make clothing, we alter existing articles of clothing only. If you are traveling through Knoxville – alterations which are minor in nature may even be done while you wait. 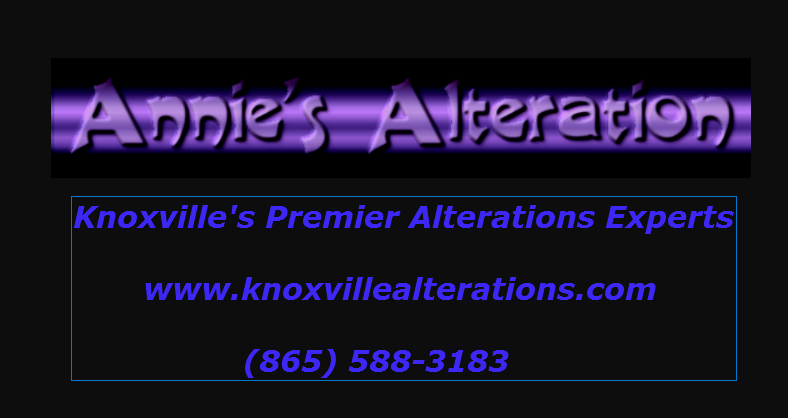 Call Annie’s Alteration today at (865) 588-3183 – The Knoxville alterations specialist!